As part of the Q(C)ollaysuyu Collaborative, CEED staff traveled with fellow Indigenous activists and educators to the Plurinational State of Bolivia to participate in the 3rd International Seminar Workshop on the Construction of a Plurinational State with Indigenous representatives from the Bolivia, Colombia, Guatemala, Brazil, Peru, Chile, Mexico, Argentina and Venezuela. The focus of the Seminar was to create an Indigenous charter for realizing the philosophical framework Vivir Bien (“Living Well”). CEED’s Director of Research Programs, Dr. Cecilia Martinez, spoke on a panel addressing justice in“sustainable” development and climate policy in the context of Vivir Bien. Legal Analyst Liza (Guerra) O’Reilly presented on the issues of environmental human rights. CEED and Q(C)ollaysuyu partners Dream of Wild Health, Phillips Indian Educators, and Bdote Learning Center also participated in workshop discussions on how to address the root causes of environmental destruction and the violation of Indigenous rights. Our delegation included CEED representatives Shalini Gupta, Dr. Cecilia Martinez and Liza O’Reilly along with Dr. Roxanne Gould, Indigenous educator and co-founder of Bdote Learning Center; Dr. Priscilla Day, University of Minnesota Duluth; Dr. Donald Day, President of Leech Lake Tribal College; Miigis Gonzalez, Board member, Dream of Wild Health; Jim Rock, Indigenous Educator and co-founder of Bdote Learning Center; Dr. Elise Marubbio, Augsburg College, and Elder Nayoka Blackbird.Our delegation was invited to meet with the Bolivian Minister of Ceremony, Fernando Huanacuni Mamani, where we exchanged ideas on Vivir Bien and how the Cochabamba Peoples Agreement on Climate Change can lead to international action in climate change and food sovereignty. We met with Indigenous groups, including CONAMAQ and the Bartolina Cisas, culminating our exchange with a two-day dialogue and tour with former Minister of Health, Dr. Nila Heredia Miranda. A highlight of our trip was a hosted visit to the rural community of Patacamaya with Dr. Miranda, where we were welcomed by the community in a traditional ceremony and given a tour of a rural hospital that is part of an innovative national health policy of integrating Western medicine and Indigenous traditional healing. Traditional healers and medical personnel are working to advance public health in their region, in an effort to decolonize health and environmental institutions. We were privileged to meet with many Indigenous groups and to hear their ideas about climate change and global sustainability. Our Bolivian exchange better helps us to build a climate justice agenda in our region. You can read the Twin Cities Peoples Agreement on Climate Change and the call for action that grassroots community members from the Twin Cities developed through a series of community dialogues in 2012. A very special heartfelt thank you to Sonia Davila and Soledad Gutierrez for their extraordinary work in hosting and providing guidance to our Collaborative. We also extend our sincere gratitude to Ivan Sanjines and CEFREC for including us in the 3rd International Seminar Workshop on the Construction of a Plurinational State and for their financial support. 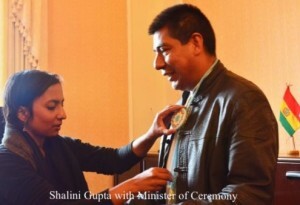 See photos of Sonia, Soledad, Ivan and the Q(C)ollaysuyu Collaborative Bolivian Exchange.